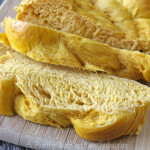 This delicious Braided Pumpkin Bread is easy to make, because you can make the dough in your bread machine! It is perfect served alongside soups and stews! Hello friends! How has your week been thus far? I just got back from a blogging conference in Toronto, which I’ll share later, so I’ve been busy getting my house and blog organized. Blogging conferences will do that to you…they always leave me feeling inspired and like I have a to-do list a million miles along. So when I feel overwhelmed by my to-do list I hit the kitchen and bake and cook. These moments in my kitchen allow me time to think and come up with plans, so that’s where I’ve been the last few days. This is good for you too because this means that I have lots of new recipes to share! So today, I’m going to share a bread recipe with you. Don’t be afraid of making bread, especially if you have a bread machine. And is there any better smell than that of baking bread? Or any better eating experience than having a slice of freshly baked bread slathered in butter? I think not. I love bread. I wish I didn’t love it so much, but I do. 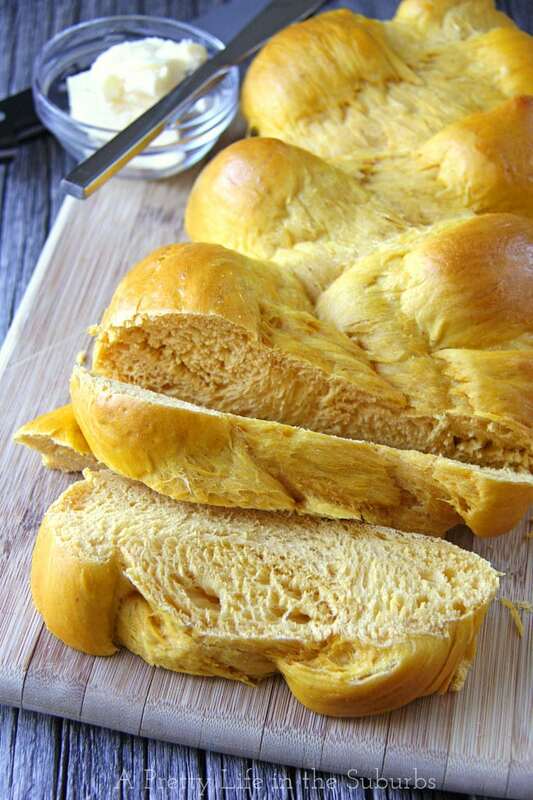 One of my most favourites is this Braided Pumpkin Bread. It is seriously delicious…moist and slightly sweet which makes it perfect served alongside soups and chili. This recipe is meant to be made in a bread machine. Measure all the bread ingredients in the order that they are listed, into the bread machine. After the dough cycle has completed, remove the dough to a lightly floured surface and cover with a clean tea towel and let rest for 10 – 15 minutes. After this time, divide the dough into 3 portions. Roll each portion into a long rope, one inch thick. Then braid the 3 ropes, sealing each end by pinching the dough together. 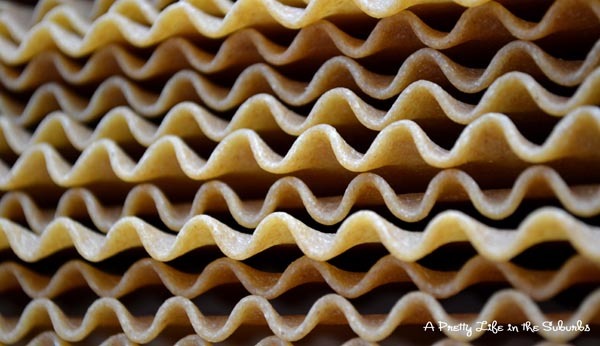 Place the dough onto a baking sheet lined with parchment paper. Cover with a clean tea towel and let rest and rise in a warm place for 35 – 45 minutes, or until the bread has doubled in size. In the mean time, mix together the egg yolk and water. When the bread is done rising, brush the top of the bread with the egg mixture. 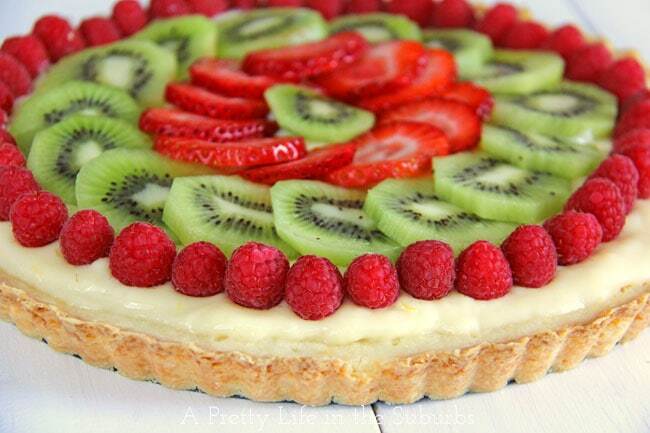 Bake for 25 – 30 minutes. When the bread is done, it will sound hollow when you tap on it. Tip! You can use any kind of mashed squash that you like. I have used butternut squash as well, and it’s delicious! 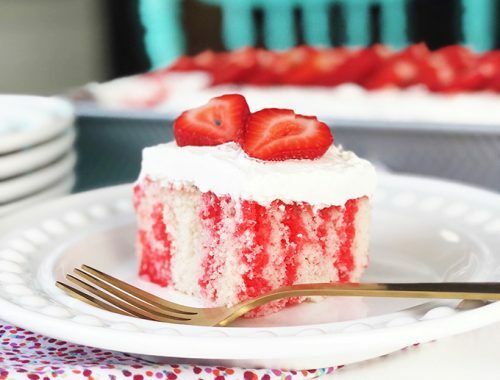 I hope you try this recipe…you won’t be disappointed. And I’m willing to bet you’ll even make it more than once. It’s just too easy and delicious not too! 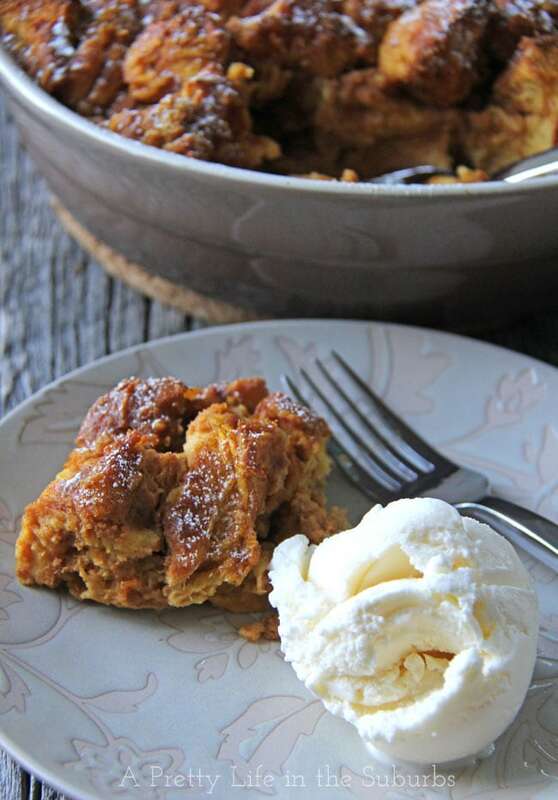 With any dry left over bread, you can make this delicious Pumpkin Bread Pudding dessert! Have a delicious day my friends! 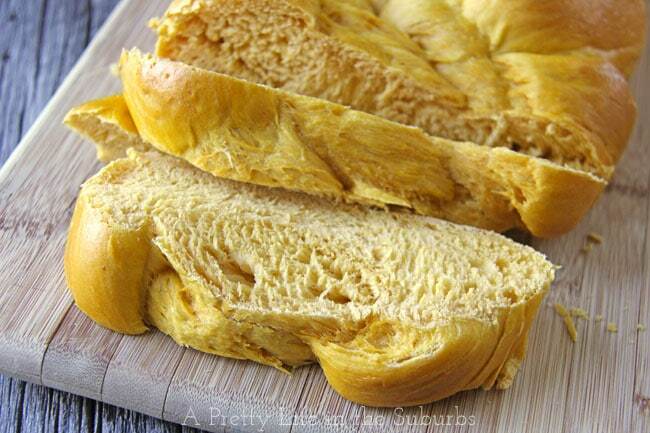 We have never eaten pumpkin bread before, it looks so wonderful, I can’t wait to try it. can you make this without a bread machine? If so, how? Hi Annette! I’ve never made bread dough without a bread machine, so I’m not sure how to do it! One day I will learn!